a-squared Anti-Malware provides Comprehensive PC protection against trojans, viruses, spyware, adware, worms, bots, backdoors, keyloggers, rootkits, tracking cookies, and dialers. 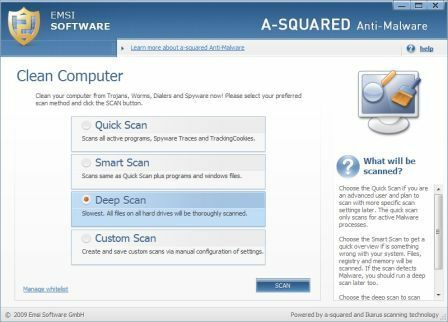 a-squared Anti-Malware is one of the best anti-virus and anti-spyware product solution in the market, which despite its name, can scan, detect and clean both viruses and malware (malware is termed as malicious software). 2 cleaning scanners in 1: the a-squared Anti-Spyware, and the Ikarus Anti-Virus engine. Performance improvement with the integration of the two engines on the lowest level. 2 guards against new infections: signature scan + behavior analysis. Typical ways of infection are disabled in advance such as websites that try to plant Trojans or Spyware or that offer deceptive contents are blocked by the surfing protection. Signature updates at least 5 times per day. 2 ways of removing Malware are better than one: automatic and manual cleaning. Malware-IDS and Background Guard protection technology stops malware before it has a chance to becoming active and harmful on PC. Application rules to protect specific programs from third-party manipulation. Ability to decide what programs are allowed to start and what actions may be performed. Community based help with decisions to provide a recommendation based on the decisions of other users when an alert is raised. Explorer integration – right click scan. File guard that checks programs while startup. Includes a-squared HiJackFree and a-squared Commandline Scanner. A one year subscription license of a-squared Anti-Malware typically costs $40. However, the developer is going to start an exclusive promotional offer which will giveaway one year (12 months) free license for a-squared Anti-Malware 4.5, the latest version of the popular security tool. Actually, the promo works in such a way that a discount coupon code worth $40 can be used to offset any a-squared Anti-Malware order. The $40 discount effectively makes the 12 months subscription license free, and other packages of a-squared Anti-Malware license cheaper by $40. The free 1 year a-squared AntiMalware 4.5 offer is only valid for 24 hours, starting from 11:11 (CET) on Wednesday, 11th November 2009. In order to get the license, user will need to register an account with emsisoft.com, which will later be used to unlock and activate the full version a-squared Anti-Malware for 1 year. More details at http://www.emsisoft.com/en/order/24h/ (expired), new offer at http://www.emsisoft.de/de/order/thirdparty/stern/signup (expired) as part of promotion for Stern.de visitors. Once there, just click on “Grab it!”, and then “Buy Now” to order a-squared Anti-Malware for free with 1 year license. Enter user name, email address and password to create an account and receive the free license coupon code. User can then login to the account to convert coupon code for key to unlock the full version software, and directly entering the user name and password after installing software to activate it. This offer is valid for 24 hours only commencing at 11:11 (CET) on Wednesday 11th November, 2009.
a-squared Anti-Malware runs on Windows XP, Vista, 7 as well as on 2003/2008 Servers in all 32 bit editions. On x64-systems the scanner and OnExecution guard work very well, but the behavior blocking module (Malware-IDS) does not run currently.